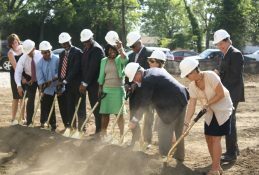 Regions partners to make an impact in North St. Louis County through small businesses, redevelopment and schools. The front door is locked, yet inside the You Gotta Eat Here diner the pace is furious. In the back of the diner, 30 turkeys with accompanying side dishes are being prepared for delivery to a catered Christmas party. In front of the kitchen counter, a camera crew sets up for a video interview. Suddenly, someone’s knocking on the front door. Again. The sign says, “Closed,” as the St. Louis restaurant is every Monday. For the sixth time in the last hour, a potential customer is hoping for a meal to go. That’s a testament to the popularity of Andre Williams’ diner. Located a few miles from downtown St. Louis, You Gotta Eat Here has blossomed on North Grand Boulevard in an older business and residential district where critics and even some fans predicted only doom and gloom. Working alongside his wife, Dorothy Daniels, the diner has prospered. The couple started out by providing food services for hospitals and businesses before opening the restaurant. Now, with help from justine PETERSEN and Regions Bank, the restaurant is the most popular hangout around. A community organization based a few miles away, justine PETERSEN focuses on micro-lending to small businesses, business development, financial education and helping people improve their credit scores. The community organization is now partnering with Regions to provide more capital for micro-businesses. “Regions, in a real way, has stepped up with us to do business,” Boyle said. Regions Midwest Area President Mike Hart said the bank is committed to communities in North County. “Justine PETERSEN’s top priorities – affordable housing, small-business empowerment and financial education – are right in line with our values,” Hart said. “They are St. Louis-based and operate in areas we serve. St. Louis is an area that has seen significant change during the last 40 to 50 years. A large portion of the manufacturing base has been lost, the housing mix has changed as population shifted west and schools have been challenged to provide quality education we should expect for our children. So we have to change the way we, as a bank, support the community. “There are some areas we know best, including financial education, understanding credit, teaching savings and borrowing smart, that align perfectly with justine PETERSEN’s priorities and can create positive uplifting change. One North County community is Jennings, which still shows signs of St. Louis’ post-World War II boom. The roads are busy and peppered with businesses. The homes are modest, attesting to the community’s middle-class roots. Still, it’s not the town Irvetta Williams left behind when she graduated from college. 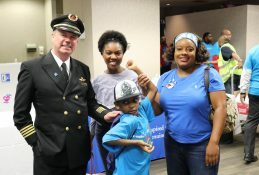 Left to Right: Rob Boyle, Irvetta Williams, Mike Hart, Dr. Tiffany Anderson. Williams points to a branch in Jennings that Regions is rebuilding. Not only will it be more modern and efficient, but it will include HOPE Inside, a partnership between Regions and Operation HOPE to provide financial empowerment and financial dignity to citizens typically underserved by banks. This is what brings Hart and Madkins to Jennings Junior High School on a blustery winter day: a chance to meet with Jennings School Superintendent Dr. Tiffany Anderson. Dressed immaculately in a business suit, Anderson moves briskly through the halls and in and out of classes thanks to her trademark white sneakers. Anderson wears the suit because she wants to be a role model to her students. She wears the sneakers out of necessity. A St. Louis native, Anderson returned to Jennings after serving as a superintendent for many years in Virginia and in Kansas City. She returned to rebuild a school system that was losing students and seeing test scores drop. She has successfully led a district rebound by focusing on preparing students for college. An impressive number of her teachers grew up in North County, so they share the same goal of giving back and improving the community. 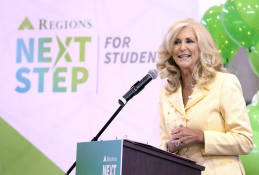 With the support of Regions, Anderson created a teachers’ academy to help her faculty thrive and expanded college preparatory initiatives to increase the number of college-bound students. She has also proven to be a thrifty steward of public funds, cutting the budget of the central office to free up money for expanding academic programs. Hart and Madkins see Anderson’s passion for her students in person. They see what true commitment to North County means, whether in a school, in a new bank branch or in a new business. “We’re trying to do our share of small things to be a catalyst for moving the St. Louis community forward,” Hart said. 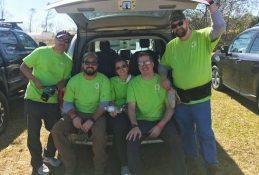 “We believe in teamwork. For us to win, Regions can’t do it alone. Neither can justine PETERSEN, the City of Jennings or Jennings schools. However, we can do it together.